Inspired by the bustling streets and tranquil beaches of South-East Asia, this month’s #SimpleFacts food board combines the subtle aromas of coriander with a fiery kick of chilli and zingy tones of lime to make an irresistible, nutritious blend of flavours. 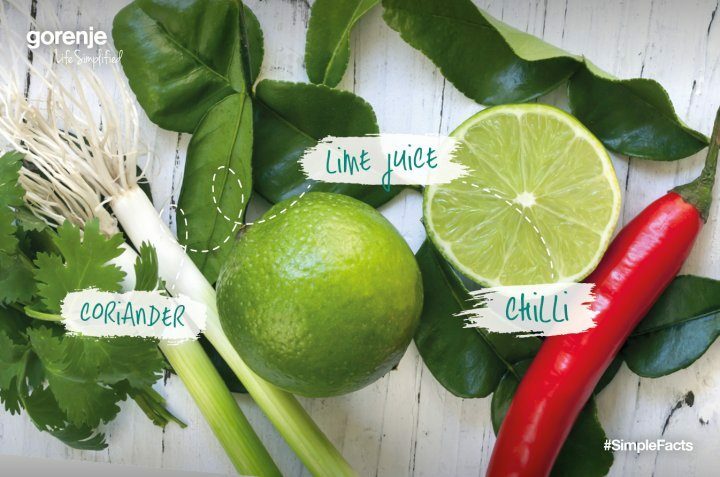 These well-loved ingredients will help clear your sinuses, boost your metabolism and, most importantly, rejuvenate your taste buds with a vibrant burst of flavour. This timeless classic is a delightfully-simple fusion of just a few ingredients designed to pack a fiery, authentic, punch. Start by placing your steak into the grill, then finely slice coriander, chillies and garlic and mix with soy sauce, lime juice and a little sugar. Remove the steak from the grill and slice into strips then fry with the sauce blend until the steak is coated and the sugar has dissolved to make a lightly-caramelised texture. Then simply mix with salad leaves and more sliced coriander and serve, you can’t go wrong. Tantalise your taste buds with a fresh and healthy meal for all the family by infusing this trio of ingredients with fresh salmon fillets. Simply place salmon in foil and add a handsome portion of sliced coriander and chillies, squeeze in a whole lime and drizzle lightly with olive oil before sealing into a foil parcel, locking in the aromas for optimum infusion. Place in a pre-heated oven for 15-20 minutes on a high temperature, once cooked, open the parcel and inhale the goodness that emerges. Serve with rice or potatoes and be sure to pour the juices from the parcel onto your plate for maximum flavour. Bring a true taste of South-East Asia to your dinner table with a traditional Thai green curry. Best made with chicken thighs but can be made with other meats or fish. Once you’ve tried it, you can expect it to become a regular favourite. For the sauce, blend coconut milk and coriander in a food processor and set aside. Wipe the processor and then blend ginger, lime juice, chillies and garlic to form a paste. Simply cook your selected meat or fish then add the paste and coconut-coriander mix and bring to a boil for about 40 minutes. Once the consistency is a perfect balance of thick but still a little runny, taste to make sure all the ingredients are thoroughly infused, and you’ll know when it’s done. Make a large batch of paste and freeze for a rainy day, it’ll lift your spirits and warm your body. Try this versatile and delicious dipping sauce, a perfect accompaniment for fish cakes that brings a tasty kick to proceedings, brightening up even the simplest of dishes. Finely chop chillies and coriander whilst heating some vinegar and sugar in a pan. Once the sugar is dissolved, add soy sauce and the chopped ingredients and squeeze a lime into the mix. This is a simple sauce which lets the ingredients speak for themselves, having some in the fridge will never go a miss. If you’re feeling inspired by this #SimpleFacts food board, head to our Twitter or Facebook channels for more or check out our content hub.